Hello and happy Tuesday. It's time for another challenge at CASology. 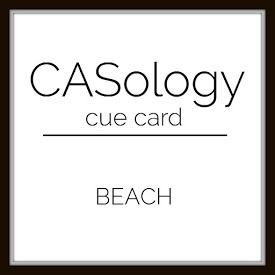 This week, our cue word is beach. If you are a regular reader of my blog, you know that I live in a little beach town in the northern part of San Diego County. My town is famous for having some of the best surfing beaches around. While I don't surf, I decided to feature surfing in my card this week. Now, it's your turn. How does BEACH inspire you? I hope you play along this week. Please remember to keep it Clean and Simple. I am also entering this card at Simon Says Monday where the challenge is stamp it. What a great teenager or guy card Joyce - fab design. Perfect beach card Joyce!! How wonderful it must be to live near the beach!! Lets go to the beach and surf together! How fun would that be! Love this fabulous card Joyce, your surfboard image is awesome! Ha! I don't surf, either (shark issues), but I surely did LOVE this card! I thought it was so clean and crisp and polished-looking! The colors are so vibrant and beachy. I am still trying to figure out how you did those incredible waves! I like how they have a semi-abstract, stained-glass type of look. This is filled with energy and creativity and I'm so glad you shared your skills with us for this week's Simon Says Stamp Monday Challenge! CAS perfection! Love the bold sentiment with the rest of your design! I LOVE the simple bold look of this card,Joyce! So your not a surfer :) it sure is a beautiful town where you live! Great card Joyce! LOVE LOVE LOVE your waves! You know I love these colors and the red surfboard is perfect. I LOVE this. So bright and bold. Love the 2 shades of blue you chose for your waves, and that surfboard POPS. LOVE the sentiment too. Altogether fabulous!!! I'm not a water-sports person (terrified of water...it's so so so....vast!! ), but sure have respect for those who are, be they swimmers, divers, or surfers! Your surf board is fabulous! Beach beautiful in every way!